For more than ten years in home crafts, gels we have been developing the traditional cakes of almond us accompanying each Christmas in our family celebrations. For more than ten years in home crafts, gels we have been developing the traditional cakes of almond us accompanying each Christmas in our family celebrations. This is one of our products star, very claimed every year by loyal customers who, year after year, want to have the same in these celebrations, as well as companies and businesses who use it in their Christmas baskets, and other customers who, attracted by the craftsmanship and homemade ingredients we use in the same, decided to try them out and nothing more do perceive and appreciate that they are made for tastes that know how to assess the taste the aroma and the texture of food care with loving care. However, last year we conducted various tests to be able to present for the first time this holiday season, a novelty in our products. 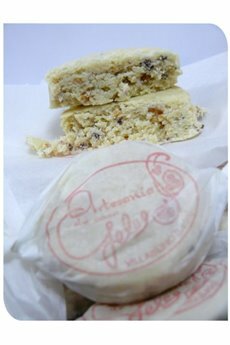 This new development are "polvorones of cecina", very similar to traditional pero among whose ingredients is the jerky, which gives them a touch of innovation and tradition at the same time. The unmistakable taste of the jerky, which interspersed with the of the polvorón maintains a touch between the sweet and the savory of great pleasure, these cakes makes a side dish for our meals and family gatherings, as opposed to the traditional cakes that are usually placed in the dessert. Leon essence of cecina and the success that is having this product shows that, despite the economic crisis which we live and the social crisis that lives our region as all the coalfields, possible alternative development for those who dare to innovate and put its products at the forefront.